Low Park Wood caravan site lies on the West banks of the River Kent, shrouded in trees and very private, and only about a quarter of a mile North West of the village of Sedgwick. 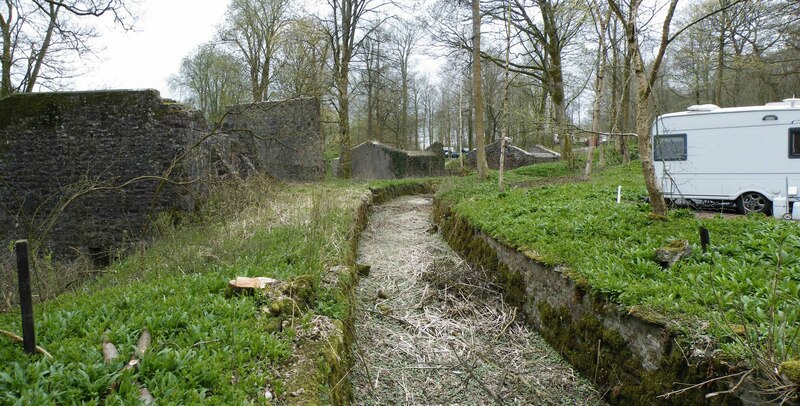 Walking around the caravan site, the remains of buildings, mill races, leats and curious earthworks abound. The works here at Sedgwick, operated from 1857 until 1935, and have left an all too visible reminder of the work that once took place here. Above. 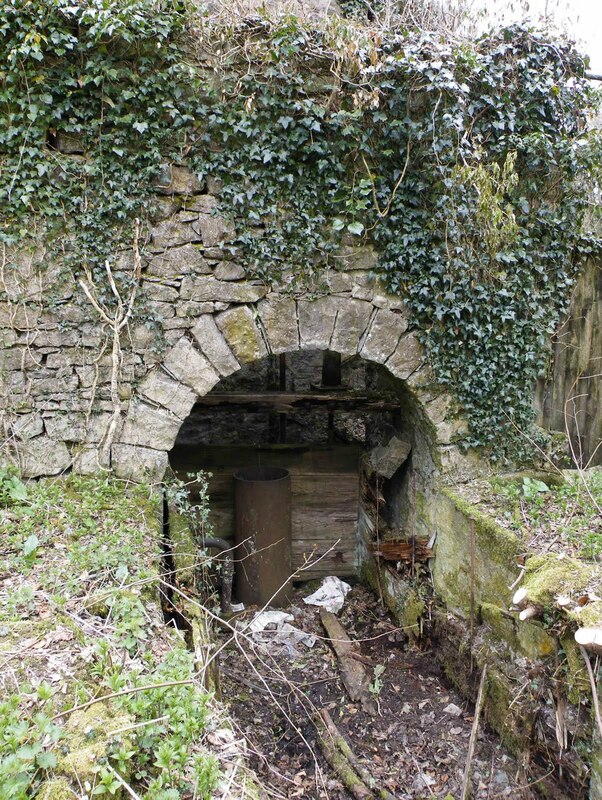 Looking into the remains of the incorporating mills. The company was established by Walter Charles Strickland of Sizergh Castle, and John Hudson of Kendal in January 1857. The Sedgwick Gunpowder Company Ltd was granted its license on the 9th of April 1857, with John Hudson as Chairman, and William Cartmell as the resident Manager. £20,000 capital was made available to the company, with the intention of creating a state of the art mill, producing top quality powder. 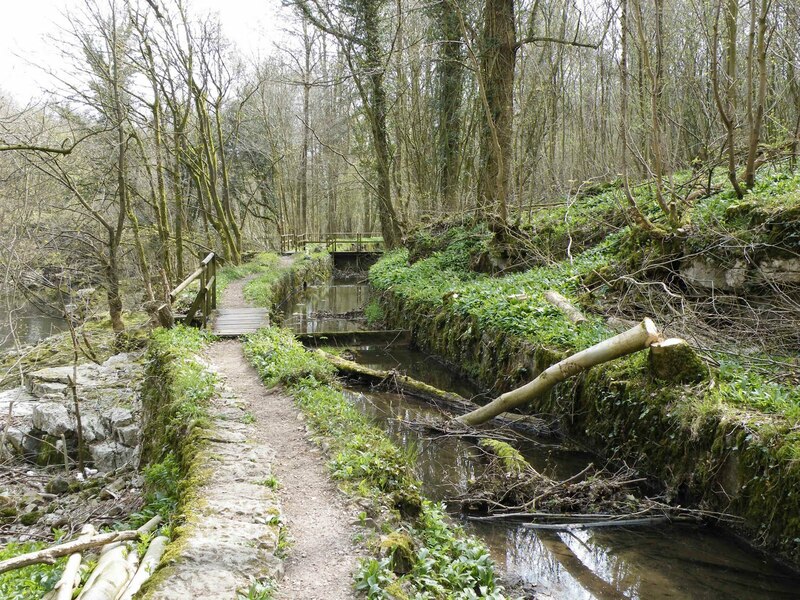 A 21 year lease was drawn up for the rental of the river banks at Kidd Holme and Low Park Wood. In 1858 there were eight men working at the works, but this was soon to change when Walter Strickland was able to recruit more men from further afield. The River Kent is a fast flowing river, and with construction of a wooden weir across its width, a long head race was constructed...over 700 yards long, and with a total drop of around 20 feet. 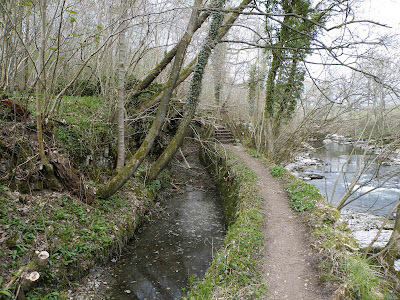 The head race, much of which survives to this day, was nine feet wide and originally five feet deep, although very much silted up these days. 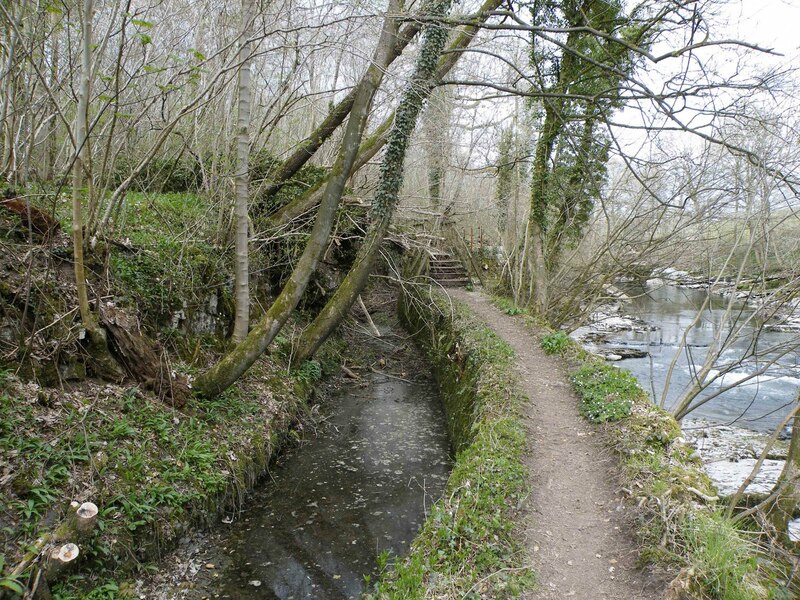 The head race was constructed of stone, and lined with concrete. The stone used to build this important structure, was quarried from a small quarry opened nearby on the Eastern side of the river. Above. Looking along the now dry leat. Above. 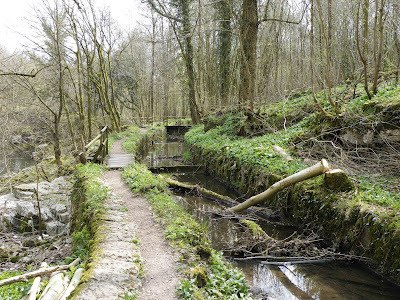 A still water filled stretch of the leat. The head race initially powered six incorporating mills, all of which were driven by a single 37 foot water wheel which generated an impressive 90hp. Either side of the wheel, were three mills taking their power from a square shaft which was turned by a ring wheel attached to each side of the water wheel. These three mills had stone runners, each of which weighed in the region of four and a half tonnes and had a diameter of seven feet. Above. Looking into a dry stretch of the leat. Above. Another water filled, river side stretch of the leat. Above. 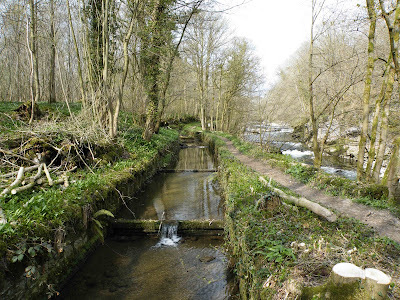 The leat, very near to where water is diverted into it from the River Kent. Water from the head race fell into the wheel pit and from here, flowed out into an underground culvert that flowed for a further 100 yards back into the river. 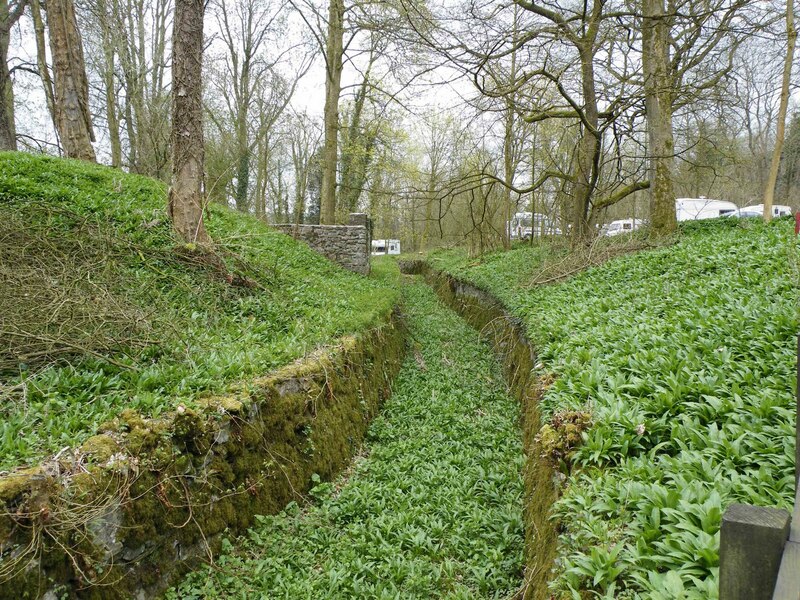 An alternative leat was used to carry water to the sawmill where a turbine was powered. The corning machinery from Greenock in Scotland, was manufactured by a company called Messrs. Hastie and was situated next to the head race, just to the North of the incorporating mills. The sulphur house, situated to the East of the incorporating mills, was the largest building at Sedgwick. The Gaze house stood next to the river side. This building was powered by its own eighteen foot water wheel, which took water from the head race. North of the glaze house stood the stove house, used to dry the gunpowder in temperatures of around 126 degrees Fahrenheit. This temperature was maintained for twelve to fifteen hours a day. In 1858 the only other buildings here at Sedgwick were the mixing house and the cooperage, which still stand today. There was no tramway to move powder and materials at this early stage of the works life, so everything had to be moved by hand in barrows and carts. Although limited amounts of powder were being produced at this time and were being sold to both domestic and foreign markets, by 1858, the Sedwick Gunpowder Company Ltd was in serious financial trouble. Although the infrastructure was sound, the company was underfunded and was not able to produce the amounts of powder necessary. In June 1864, the company ceased trading due to lack of funds, and by September of the same year, it was officially wound up. It wasn't long before a new company, imaginatively named the New Sedgwick Gunpowder Company Ltd appeared on the scene, no doubt eager to make use of the foundations laid by the previous company. The company was backed by a group of Manchester businessmen, with a starting investment of £50,000 raised through the issue of £10 shares. The new company, headed by Henry Swinglehurst from Appleby, set about building a new set of mills in addition to the existing ones. 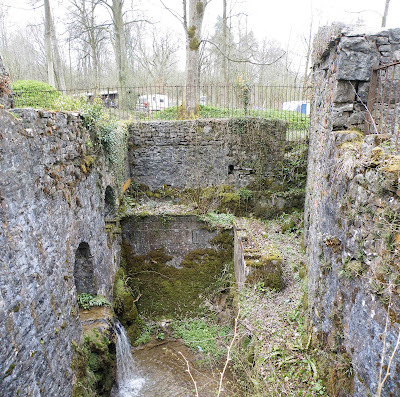 A new twenty foot water wheel was built, as well as a tramway and a storage magazine. It is estimated that these additional building works cost around £8,000. The new mills operated eight hour shifts, and as a result were able to produce over 4,000lbs of powder a week. The new company utilised the areas two main transport systems...the canal, which was only a few miles away, and the railway. Both forms of transport were used to bring the inward bound raw materials, and the outward bound finished products. The port at Milnthorpe was also used for the shipment of finished powder. On the 22nd of October 1871, the New Sedgwick mills experienced first hand the unpredictable nature of the very substance they were striving to produce. During the course of some maintenance work, a spark from a chisel being used on the roof of the press house, ignited powder residue, causing a substantial flash explosion. Thomas Jackson was flung, together with the whole of the roof, into the air, suffering two broken arms and a fractured skull. Two other workers standing nearby suffered serious burns. Thomas Jackson was later to die from his injuries. Re-building work was slow to commence, and even slower to complete, extending well into 1872. Above. Looking towards the incorporating mills. The mills suffered yet another explosion, on the 24th of April 1874, when William Dodgson and Will Booth both suffered burns after an explosion in the corning house. Both men survived and continued to work for the company. The next year, on the 30th of June (1875) there was yet another explosion at the mill. The corning house exploded, followed a split second later by the press house. This time there was significant loss of life. William Booth, survivor fo the 1874 explosion died, as did Charles Page and William Dalzell. William Dodgson, also a survivor of the 1874 explosion, died of his injuries later that night. As a result of this accident, both the corning house and press house were completely destroyed, along with all the machinery employed in these two buildings. As well as the sad loss of life, the destruction of the buildings and machinery cost the company in the region of £500. The whole site had to be shut down whilst repairs and rebuilding works were undertaken. 1878 saw another two explosions on site, albeit with no further loss of life and minimum damage. 1880 and 1881 saw the company experimenting with the manufacture of gun powder cartridges. New machinery was brought in and a new hydraulic press was constructed, powered by water from the head race. Unfortunately for the company, the processes they were using were already under patent, and a legal challenge was mounted. A date was set for the hearing to take place, but it never happened, so the works were able to continue manufacturing their new products. The company further expanded its line of products, by adding compressed powder pellets to its catalogue, for use in coal mines. The 12th of April 1883 saw perhaps the worst accident at Sedgwick in its 78 year operational history. This time, the cartridge house, situated about three hundred yards from the main site office, exploded. Such was the ferocity of this blast, it was heard in Kendal and witnesses attest to the bright white light the explosion emitted, closely followed by thick black smoke. Three men were killed in this enormous blast. James Shepherd died a few hours after the explosion. His colleague Henry Cheeseman also died a few hours after the accident. Arthur Cheeseman, Henry's uncle died two days later. Although the death toll was only three, the sheer size of the explosion seems to have destroyed a huge amount of machinery and buildings. An inquest cleared the company of any wrong doings and blame. In 1885, one of the incorporating mills was struck by lightening, killing a powder man. In 1886, the company was purchased by Henry Swinglehurst who had managed to buy out his fellow investors and owners. The company was renamed as the New Sedgwick Gunpowder Company Ltd. Henry appointed his son, J.A. Swinglehurst as manager and the company became a family interest. The new company employed in the region of fifty people and was now producing around twenty five tonnes of powder a week. Henry Swinglehurst died in 1895, control of the company being handed over to his son. 1900 saw the technology for power production at the works greatly improved, with the addition of turbines built by Gilkes and Son of Kendal. Above. The cooperage and saw mill, with the remains of the turbine tower. Five turbines were installed creating a total output of around 50hp. The water wheels, head race and leats were all but redundant. Above. 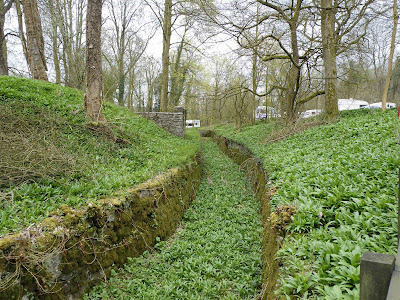 The leat flowing into a small wheel pit to power the cooperage. Above. 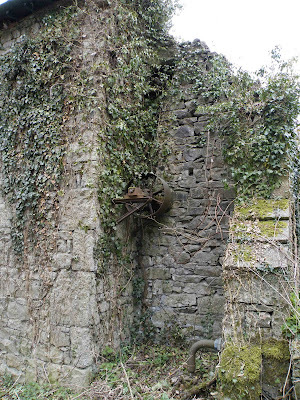 The remains of one of the Gilbert and Gilkes turbines. 1903 saw yet another huge explosion at the works, again as the result of sparks from maintenance work being carried out. The 30th of March explosion saw the deaths of two of workers, James Shaw and Edmond Newton. The glazing house exploded as a result of sparks from a bronze hammer being wielded by Edmond Newton, who was engulfed by the explosion. In total, it's estimated that around 8100lbs of powder exploded. This huge explosion sent red hot debris flying onto the roof of the corning house, which contained an additional 1000lbs of powder....it wasn't long before this too exploded. It seems that the later years were nothing but a list of accidents and explosions....23rd June 1906, was no different. The weather was warm and muggy, with thunder storms rumbling in the distance. Sometimes toward 11pm a flash and a loud clap of thunder heralded a huge explosion, emanating from the press house. Lightening had struck this building igniting powder stored here. The ensuing investigation into this explosion, which had damaged the press house, number eight mill and number nine mill, concluded that there may have been three lightening strikes in very quick succession. It was lucky that not only were there no deaths in this incident, no-one was even injured. It's ironic that the only building totally destroyed by the lightening strikes, the press house, was also the only building that had been kitted out with a lightening conductor. Above. 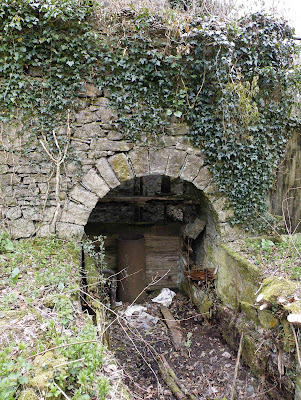 Possibly one of the stove buildings. In 1917 the company was acquired by Explosives Trades Ltd, and the Swinglehursts finally let go of the company. The company then changed hands again, in 1920, this time it was taken over by Nobel Industries Ltd. The new owners introduced new production methods and new machinery, including a mass of hydraulic equipment. The new machinery enabled workers to produce up to one hundred cartridges at a time, whereas before the older equipment had limited them to about eight. Sedgwick was now producing about 11,000lbs of cartridges a week by now. In 1926, the final owners took over, ICI, who had started to buy up many of the powder works in Cumbria. Very little of any substance appears to have happened between 1926 and 1935, when the Sedgwick works finally closed. All we are left with now, are the intriguing buildings, walls, channels and mounds of earth dotted around this river side location....a living memorial to those that lived, worked and lost their lives here. Information on Cumbria's gunpowder industry. Some additional information from English Heritage. A community web site with some great information about the local area. staying only one night on the camping place, havent enough time to study the mill, your information do it afte my holidays very well!! Saw mill looking so nice.Great visit here.Nice one. 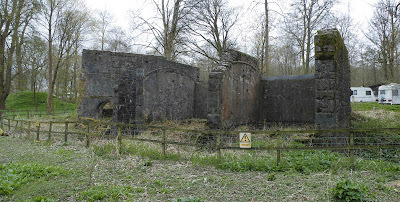 Just walking around the site and then reading about the gunpowder industry here locally just brings it to life. You can almost hear the works and smell the gunpowder. 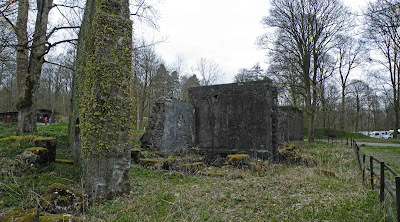 It's a shame even more is not made of the ruins with information plaques etc even a living museum. Just stayed on the campsite for two nights and walked the dogs around all the old buildings, thank you for all the information, most informative, pity there is not more information about it on site as it is part of history! Have been visiting this place for the last 20 years camping and have painted many pictures of the beauty in all seasons it has a very special atmosphere of warmth and contentment and perfect peace now and is our tranquil paradise.